After shutting down Giant Robot Magazine at the beginning of the decade, I knew there would be a time to get it going again. It turned out that 2017 presented the right circumstances and Giant Robot Media was born. We bobbed and weaved across the globe, met hundreds of people, and told their stories. The 75+ pieces of content produced this year were both familiar and fresh and reassured me that Asian and Asian American popular culture is growing. We picked our favorites from a few categories including food, art, and media, and we hope you join us in exploring even more in 2018. Donut Man is a Southern California legend. Owned by Jim and Miyoko Nakano, the iconic donut shop on Route 66 stands out for their consistent quality and service. Their perfectly timed donuts are hand-made with care, and a true donut connoisseur can taste the difference. Throngs from the L.A. Basin and beyond pilgrimage to Glendora to pay respects to one of the highest-rated donut shops in the nation. How many shops can boast that Elvis indulged in their product? The stand is open 24/7 and a line never ceases. We sat with Jim while eating tiger tails and learned how he became the Donut Man. Chef Niki Nakayama and Sous Chef Carole Iida-Nakayama are bringing Kaiseki dining culture to the eaters of Los Angeles with the focus on what it means to be Californian. n/Naka has a unique approach to Californian Japanese cuisine that makes the restaurant extremely successful. Their careful selection of local ingredients infused with their Asian American upbringing brings an incredible experience in the dining room and on the palate. Enter Yumi Sakugawa’s creative world, where squishy creatures and cosmic wonder are abundant. While she was an undergrad at UCLA, Yumi came to Giant Robot and became exposed to indie comic artists. Almost a decade later and her zines can now be found in select indie bookstores throughout the country. In addition to whimsical self-published zines, she also has four books, the most recent being The Little Book of Life Hacks. Her books can be found at major chain bookstores and on best-of-the-year book lists, a huge shift from underground zine fests. Rob Sato’s watercolor paintings have changed suddenly. While past works once detailed hair follicles, grotesque beings, or wrinkles on giant mammals, his new pieces have shifted into forms with subtle narratives and social commentary. Instead of dazzling you with details, Sato has turned to emotion via vibrant color. 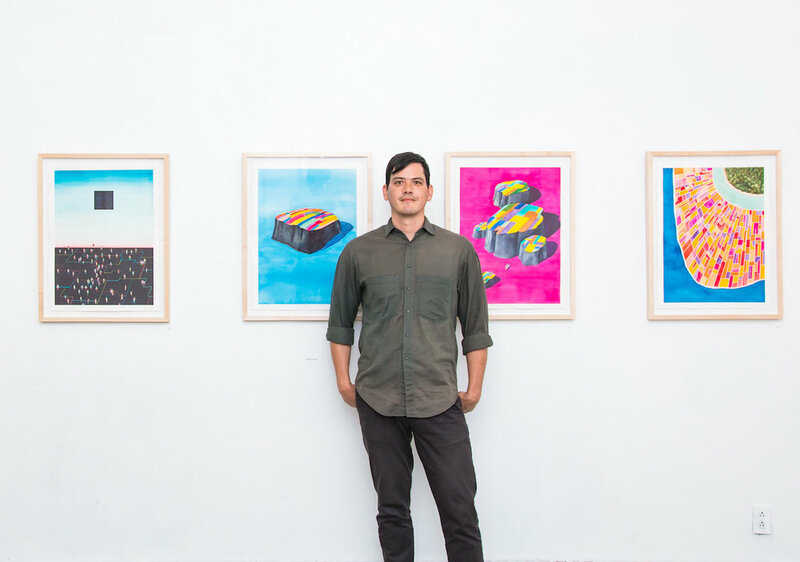 In his recent exhibition, Arco Iris, Sato illustrates a world that’s not only about how we view rainbows, but how ideas are captured in mythology. In the avenues of Oakland, a group of artists create in a two-story studio loft. 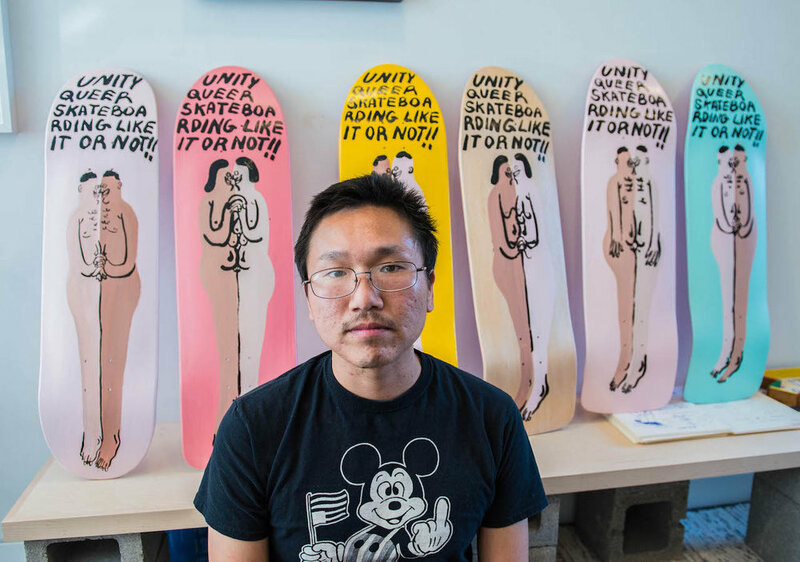 Among them is artist Jeffrey Cheung whose space includes piles of skatedecks, t-shirts and prints which are a part of his brand, Unity. Cheung, 27, grew up skateboarding and recently founded a brand that lives up to its name by being open to all genders, ethnicities, races and even skating styles. The entertainment industry is notorious for whitewashing Asian/Asian American characters. Simultaneously, the roles available for Asian/Asian American actors usually perpetuate Asian stereotypes. Actor and director Justin Chon wants that to change. Rather than wait for the perfect script to fall in his lap, Justin directed his own film and smashed stereotypes in the process. His film, Gook, highlights an unlikely friendship set against the backdrop of the 1992 LA Uprisings. Samuel Goldwyn picked up the highly acclaimed film and it's on its way to Sundance NEXT FEST. 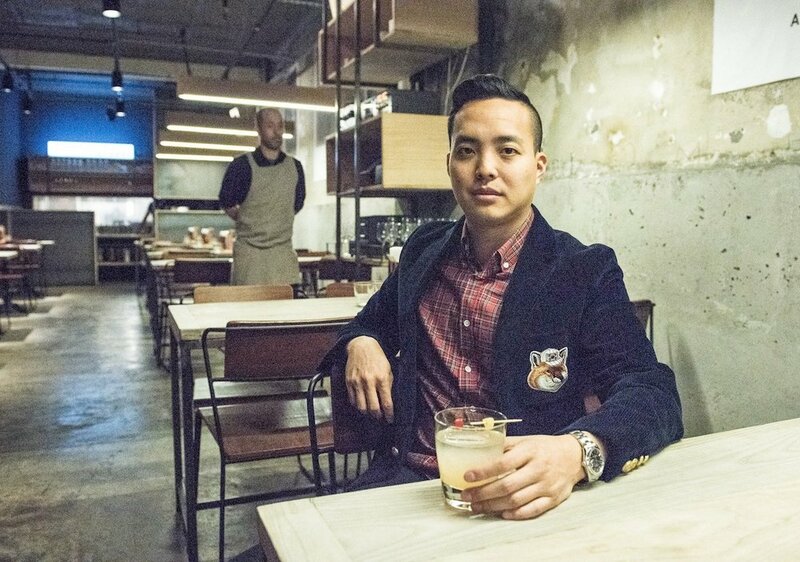 By creating his own content, Justin exemplifies ways to outsmart the industry and transcend Asian American media representation. Very rare does a person go through a Beethoven experience and come out of it a stronger musician. TOKiMONSTA's newest album, Lune Rouge, is an anthology of musical palettes from the old to the cosmos. The once pianist turned electronic artist uses her wide range of influences from Sun Ra to the Wu Tang Clan to construct a truly unique set of songs that describe her personal journey of battling Moyamoya disease. The album is filled with collaborations with artists including Yuna, MDNR, Selah Sue, and more. We asked TOKi for her favorite place to hang out in K-town. She responded with, Beer Belly. We met her there and asked her about her album, music, and story. In 2016, Master of None received an Emmy for Outstanding Writing for a Comedy Series. It was a big shock, since the show was in its first season on Netflix. It was a big victory. However, perhaps a bigger victory is the speech the show’s executive producer and writer, Alan Yang, gave that evening. Master of None is coming back for Season 2 on Netflix this May. Knowing that Alan is a big foodie, we invited him to Atoboy, a restaurant we covered earlier, to talk about the show, his life, and his obsession with food. THANKS FOR SUPPORTING GIANT ROBOT MEDIA FOR OUR FIRST YEAR BACK IN THE (ONLINE) MAGAZINE WORLD. WE ALL HOPE YOU HAD A GREAT 2017. NOW ONWARDS TO 2018!